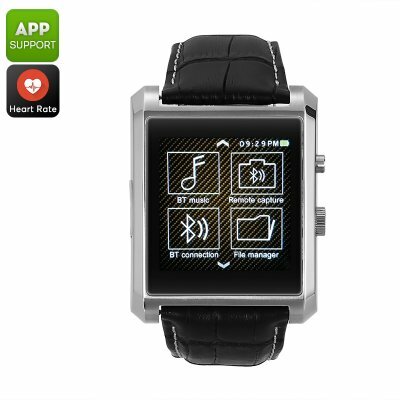 Successfully Added Domino DM08 Bluetooth Watch - Pedometer, Heart Rate Monitor, Sleep Monitor, Sedentary Reminder, APP, Bluetooth 4.0 (Silver) to your Shopping Cart. The Domino DM08 Bluetooth watch increases your connectivity like never before. This smart watch is compatible with both iOS and Android phones via the dedicated mobile App. When synchronized, it treats you to call, message, and social media reminders. Thanks to this, you can be guaranteed that you’ll never miss out on an important update again. With this Bluetooth watch on your wrist, you’ll always stay up to date on the latest activities of your friends and family. The watch itself features a beautiful 1.54-Inch touch screen and stylish design. This makes your Bluetooth watch suitable to be worn along with any outfit. Besides treating you to incoming call and message reminders, this smart watch also comes with a number of smart fitness features. Take its pedometer for example. This feature allows you to keep accurate track of the total numbers of steps you take throughout the day. Additionally, the smart watch also comes with a heart rate monitor. This test lets you check on your current heart rate based on which you can adjust the intensity of your upcoming workout sessions. With a sedentary reminder in place, you can be sure that you’ll never miss a workout again. Within its sleek body, the Domino DM08 Bluetooth watch packs a sophisticated 360mAh battery. With its Bluetooth 4.0 connectivity, you can be assured to undergo a smooth and lag-free experience. Simply pair this beauty with your smartphone, and you’ll be ready to go. This wrist piece will keep you up to date about the time, incoming messages, and helps you work towards a healthier future. This smart watch comes with a 12 months warranty, brought to you by the leader in electronic devices as well as wholesale electronic gadgets..